One: My family. I am so very blessed to have the family I do. I never thought I would be lucky enough to have the family I do. 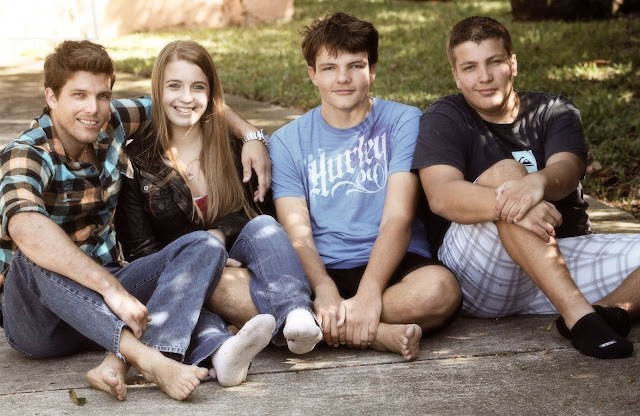 (above, my three nephews with Bre) I am so lucky to have them in my life! Two: Forgiveness. It is something we all need at times in our lives. We are hear to learn and of course that means making mistakes. I am so very thankful that forgiveness can be given but also received. Three: Home. I love this home more then any other we have ever lived in. It feels like home. It always feels good to pull in the driveway. I love just sitting quietly and thinking. This home gives me such peace. Four: Friends. I am so very blessed to have friends who really know me and accept me for who I am. It's so nice to have people that get you and you can be yourself with. Five: Roxie. She is the first fur baby we had as a family and she is such an important part of our family. She is loving and sweet. She is a true gift who loves us unconditionally. Six: Books. This year especially I have found books to be such an escape. So lucky to be able to have time to read and get lost in the stories. Seven: Weight Watchers. This has truly been the best program for me. I have succeeded where I haven't been able to before. I am still working hard. I have been off track with it the last couple of months, but I am still way ahead of where I started! 45 pound down! Eight: Hot Chocolate. I love being able to sit by the Christmas tree with a cup of hot chocolate. There is just something so soothing about it. Nine: Paper crafting. This hobby has brought so many wonderful people in to my life. People who I met never have gotten to know otherwise. I feel so blessed to be a part of this wonderful community building relationships with some amazing people. Ten: My camera: Silly? No...it helps me catch everyday moments, important moments and the silliness that is my life. I love love love being able to "see" those moments and me reminded of the feelings that were present at those times.